Art deco design came into being in the 1920s. First introduced to the public during the 1925-“Exposition Internationale des Arts Decoratifs et Industriels Modernes”, held in Paris, it aimed at creating a fashion style in union with modernism. The art deco design became a popular trend in the 1930s particularly in western Europe and the US. The movement blended decorative arts and architecture with the desire to create a fashion sense that symbolizes wealth and sophistication. The movement became so popular that it even turned its way to mass-produced wares as well as individually crafted luxury items. Art Deco influenced many art forms and gave birth to a wide range of elements. There was art deco interior design elements, art deco graphic design, art deco tile designs or art deco home design currents. To get a grasp of the movement’s popularity, there were even art deco furniture designers, art deco nail designs, art deco floral designs as well as art deco kitchen design or art deco jewelry designs. Many more countries adopted this current throughout the entire world, especially in the inter-war period. Countries such as Lithuania, Norway, Spain, Romania, Mexico, Australia or New Zeeland adopted much of this style. It can be seen especially in the design of many buildings, from private to governmental ones that managed to survive. Among the most notable influences on Art Deco design were Art Nouveau alongside the Bauhaus school and Cubism. The movement also drew inspiration from American, Indian, Egyptian and even nature. The style was meant as an admiration for modernity and machine-made objects. It revolved around principles of relative simplicity, symmetry and unvaried repetition of elements. It made use of many man-made substances from plastics and vita-glass all the way to natural ones such as jade, ivory, and chrome. Ninety years after it first appeared, art deco design grew again in popularity. We observe many features of the style slowly being reimplemented into private and public buildings. Many homeowners choose to include this style into their homes, bringing a bit of the 1930s golden cinema age glamor. 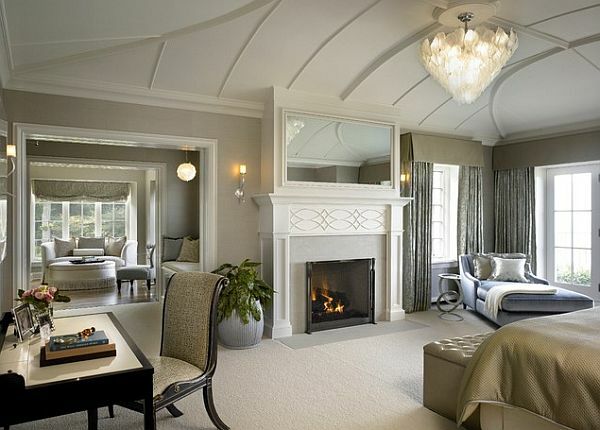 Following up we will try to present a few art deco design ideas that will surely catch the attention of many. Art deco design ideas have been implemented in homes all over the world. Many post-communist countries still have remnants of buildings from the inter-war period created in the art deco style. This should us an idea how sought after this architectural style was in the 30s. Many modern landmarks have also been created in the hight of this movement. Some of the most notable examples are the Chrysler Building, the Empire State Building both in New York City. Other notable examples come from Chicago with the McGraw Hill Building and Miami’s South Beach hotels that combined pastel color with deco lines. Gentle Walls. Stucco is the key here. Walls of art deco homes present curved corners, and the exterior is laid with stucco material. This is probably one of the main features of an art deco home, easily recognizable if you pass by it. Exterior Beautifications. Drawing much of its inspiration from Ancient Egyptian culture, the exterior of art deco homes were filled with lavish motifs to catch passing people’s eyesight. Zigzags and a multitude of flowers increased this style’s decorative aspect. Flat Roofs. Although some might contradict this notion sighting famous landmarks such as the Empire State Buildings, art deco design ideas for home included flat roofs. We have to keep in mind that in the 30s there was the so-called “battle of skyscrapers”. That is why many of these landmarks built in those times had pointy rooftops, to catch the title of the “tallest building in the world”. As loud as it might have been on the outside, art deco buildings were even more lavish on the inside. Very frequently associated with the 1930s cinema glamor, the interior design of homes built in this movement were meant to awe. Some might say that it a very suffocating interior design style opposed to its more modern counterpart, such as the minimalist design style. We have to remember that they were meant to impress. To give a feeling of wealth, power and style to those who entered its chambers. Although resurfacing as a decorative style in the 21st century, many of its elements are preserved from the old days. Unique Geometric Designs. Curvilinear and rectilinear forms are somewhat of a trademark of the art deco design. Rooms filled with daring wallpapers that had strong geometric shapes combined with the above-mentioned forms were meant to catch the attention of whoever entered the room. aterials and even metallic paints were meant to display man’s fascination for the machine. Artwork and Sculptures. If there are one thing, art deco homes never lacked was the abundance of artwork to showcase wealth and power. Of course, one might say that overly using a thing might turn it into kitsch, yet art deco homes didn’t seem to fall under this impression. Vivid and Monotone Colors. Any art deco home has a high-contrast color palette. While bathrooms and kitchens were usually decorated in black and white tiles, the rest of the house was as lavish in terms of color as it could be. Materials such as ceramic and porcelain also helped bring about a high contrast of colors. Art deco design has been for better or worse a cornerstone in modern design principles. The fact that it touched many aspects of art from interior design to architecture all the way to goods such as jewelry, furniture or clothing brought this style in the attention of many. Whether this style is for everyone is yet to be seen. However, one thing is sure: art deco design brought about modernism in many people’s lives.